Untouchables is an integrity test on Scotland Yard. It is the result of a six-year investigation into how the most powerful police force in the United Kingdom claims to tackle corruption, racism and mismanagement within its own ranks. In 1993, the Yard set up a secret anti-corruption operation run by undercover cops whose existence was known to only a few senior officers. The Ghost Squad operated for five years spying, lying and concealing information with no independent oversight. In 1998, its shadowy detectives went public as the Untouchables their motto: ‘Integrity is Non-Negotiable’. Commissioner Sir John Stevens promised they would bring bent and unethical colleagues to justice. But instead of thorough corruption investigations, there was corruption management. Instead of justice and accountability, there was cover-up. Based on official documents and over 1,000 interviews with criminals, supergrasses, police whistleblowers, former anti-corruption officers and judges, many of whom have never spoken out before, let alone on the record. Untouchables is in the best tradition of hard-hitting expose journalism, naming names and packed with revelations. It tells the secret history surrounding the Jill Dando case and the key unsolved murders of Daniel Morgan, David Norris, Stephen Lawrence and Rachel Nickell. The authors also expose the buried history of the biggest armed robbery in British criminal history – the 26 million Brinks Mat gold bullion heist, which is still dogging Scotland Yard on its 21st anniversary. 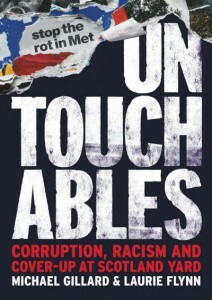 Untouchables presents a timely and well-evidenced case for a fully independent system of policing the police. New Labour and the Tories have declared a War on Crime in the run up to the general election next year. In his keynote speech at the recent party conference, Tory leader Michael Howard promised to unshackle the Police from the burdens of accountability and due process. The criminal justice system will be recalibrated in favour of the victims of crime, he said. Howard had made exactly the same speech in 1993 as home secretary in the John Major Government. Under his watch Scotland Yard set up a secret unit called the Ghost Squad to examine just how corrupt was the most powerful force in the UK. With no independent oversight, for the next four years this Ghost Squad secretly buried compromising information. When New Labour came to power in 1997 on an anti-sleaze vote, the Yard was ready to face the public inquiry into its bungled handling of the Stephen Lawrence murder investigation and the aura of corruption that pervaded it. The Ghost Squad went public as the Untouchables. Parliament was assured there was going to be a no hiding place blitz on the bent. But instead, more corruption management and cover up followed. At first, New Labour fought the backlash against the Lawrence Inquiry. But after the events of September 11 and the lurch to war on a false premise, the Yard is now a key ally in Tony Blair’s War on Terrorism. This dark alliance is unlikely to be held accountable by the new police watchdog, which the Home Office set up in April 2004. The so-called Independent Police Complaints Commission is stacked with retired cops led by the former boss of the Untouchables. Meanwhile, home secretary David Blunkett is intent on bringing back the discredited supergrass system on an equally false premise that these dangerous witnesses were successful during the War on Corruption. Nothing could be further from the truth. · Untouchables is the first integrity test of Scotland Yard in 30 years. It exposes how the force really investigates dirty and racist cops in its own ranks. · It tells the stories of the seven supergrasses behind the War on Corruption and reveals those criminal allegations that the Yard ignored or covered-up. · Untouchables exposes the secret history of five unsolved murders which still rock Scotland Yard: from the death of private investigator Daniel Morgan, police informant David Norris, black teenagers Stephen Lawrence and Damilola Taylor to the TV presenter Jill Dando. · It also reveals the buried history of corruption surrounding the biggest armed robbery in British criminal history on its 21st anniversary – the iconic £26 million Brinks Mat gold bullion heist. · Untouchables explores the true legacy of soon to retire Commissioner Sir John Stevens, his predecessor Lord Paul Condon and the man waiting in the wings, Sir Ian Blair. · It also examines the past of retired DAC Roy Clark, the J. Edgar Hoover of British policing reinvented as the Peoples’ defender in the new police watchdog. Clark is one of a number of former Untouchables inserted into the police complaints system in England, Wales and Northern Ireland. · Untouchables asks what bang did taxpayers get for their bucks. More than £100 million has been spent by the Yard in ten years. Very few of the estimated 250 dirty cops they identified have been prosecuted. Nevertheless, the Home Office is exporting this failed anti-corruption model across the UK and to other police forces and unsuspecting publics in Australia, the US and South Africa.